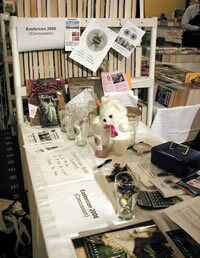 The Concussion Table - I'm pleased to report that we sold lots of memberships (and a bunch of beer glasses). 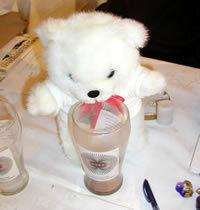 The Concussion Bear - Yes, I know he's under age. That's only hot chocolate he's drinking. Stuff for Sale - The dealers' room was more bookish than anything else, but there were plenty of other stalls too. 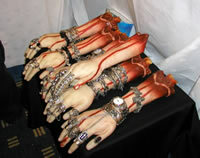 Very Handy - A convenient way to show off Goth jewelry. 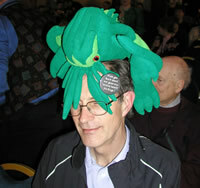 Geoff Ryman has his brains eaten to raise money for EuroClarion. Fluff is happy to oblige. 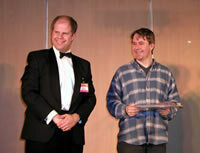 MacLeod Wins - Ken collects a BSFA Award for the cover of Newton's Wake. Two Types - Al Reynolds gives Simon Bradshaw a lesson in sartorial elegance, Gordon van Gelder style. The winners and presenters of the BSFA Awards. From the left: Charles Stross, Vincent Docherty, Colin Harris, Ian McDonald, Ken MacLeod, Simon Bradshaw, Al Reynolds.